If you are just coming to this for the first time, please go back one week to read Episode One: The First Little Piggy. The big bad wolf than said, “I will huff and I will puff and I will blow your house down!” He than did so, and then ate all the little piggys, but don’t worry they weren’t my little piggys they were John's. The first (little piggy)’ went back to Hill Center where they gave him his prerequisite override and told him that if he took it to the registrar they could put him in the right class. The second (little piggy)’ went back to Administrative Services Building One Annex who told him that they couldn’t do anything without a special permission number which he probably couldn’t get because he still had a Z in Calc I. The third (little piggy)’ applied for a special permission number anyways. The fourth (little piggy)’ went back to Engineering Building where his dean put him in his Mechanics-Statics class. He was now taking enough credits to be official a full time student. The fifth (little piggy)’ got the special permission number and took it his prerequisite override, his proof of getting into his class to Administrative Services Building One Annex were they told him no this is The L Office Of The Registrar he had to go across the hall to The B Office Of The Registrar. The sixth (little piggy)’ went across the hall to The B Office Of The Registrar where they put him in his math class. The seventh (little piggy)’ went to his professor for Calc I office hours where he discovered that in fact not only hadn’t he replied to his emails but he also wasn’t there. That is version of the little piggy song, and if you want to know what happened to the last three little piggy primes my response would have to be "there is a next semester". There is only one right answer to that question- "I don't care." Should striped bass have the right to remain silent? 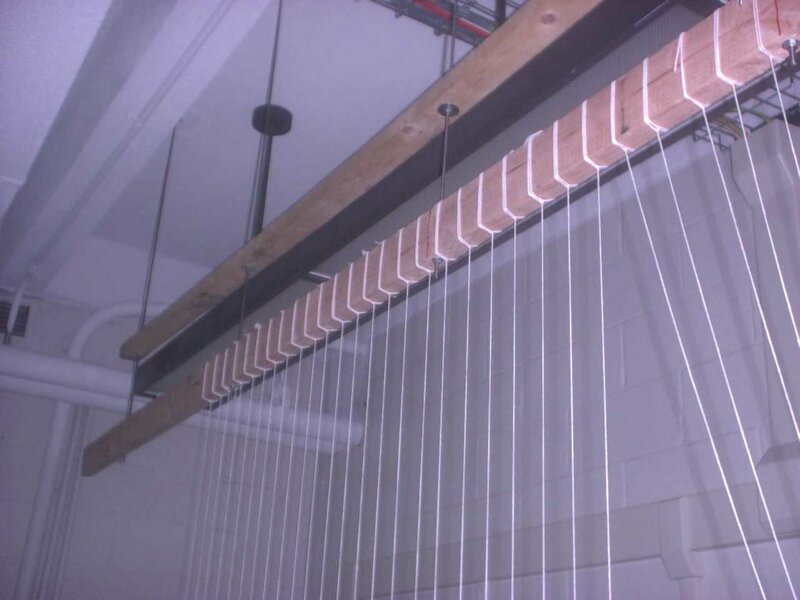 By the way, I came up with a cool catenary experiment and the awesome mathclub made it happen. See info and pictures here. oh, and friday I saw a squirrel fall out of a tree. I recently ordered a single 12ft long 2x4 from Home Depot in New York City which I needed delivered to me at YU. Unsure of how to get something that I ordered delivered to a lab, I told them to deliver it to my (10x18 ft) dorm room. Looking out the window of Belfer Hall I saw a very long something leaning against, and, in fact, well over the campus "security" booth. I figured this was most probably my 2x4. Eventually, I made my way to the booth, and verified that it was the Home Depot delivery I was expecting. The delivery guy was very eager to have me sign the delivery confirmation thingy and be on his way. After the Home Depot guy hurried away, security wasn't about to let me get away so easily -- after all, what did I need such a large piece of lumber for, and in my dorm room, no less? After some explanation, I was able to convince him to let me bring the thing up to the 13th floor lab where I needed it. It is now safely bolted to the ceiling. This is my rendition of the little piggy song based on real life experiences. The first little piggy went online to check his spring semester schedule and discovered that he had been removed from his Calc II and his Mechanics-Statics class. The second little piggy emailed the registrars office, who replied telling him that he had a Z in Calc I, and since Calc I was a prerequisite for Calc II and Mechanics-Statics he had been unregistered. The third little piggy emailed his Calc I professor to find out why he had never told the school what he had gotten in Calc I. The third little piggy never got a response so he emailed his professor again; he still got no response so he emailed him a third time, still no response. The fourth little piggy emailed the dean, who informed the fourth little piggy that in fact he could do nothing. The fifth little piggy went to Hill Center where the math department told him that he had to go through the Registrars office. The sixth little piggy went to Administrative Services Building One Annex where he was told “No that goes through the dean’s office”. 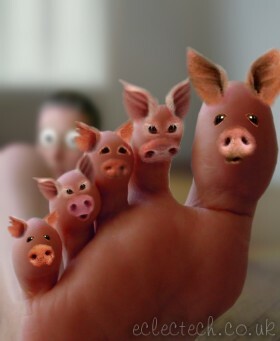 The seventh little piggy went to the Engineering Building where the secretary told him that they couldn’t do anything, but to come back on the 16th. The eighth little piggy emailed his dean again, asking why the secretary told him to come back on the 16th when he had talked to her on the 17th. He replied that he had no idea what she was talking about, but that if the little piggy had proof, such as a note from the professor, showing that he had a grade then the dean could put him into any open section of a class. The ninth little piggy went to the deans office where they told him, "It is 12:00, we are closed, come back after lunch;" when he went back after lunch they told him that the dean wasn’t there since he had left at 12:00. The tenth little piggy went to the math department and asked for a special permission number, so that way the dean could put him into a closed out section of his Calc II class, they gave him a sheet of paper with the instruction to apply for a special permission number; he went online to apply, where it told him he needed a prerequisite override, not a special permission number. 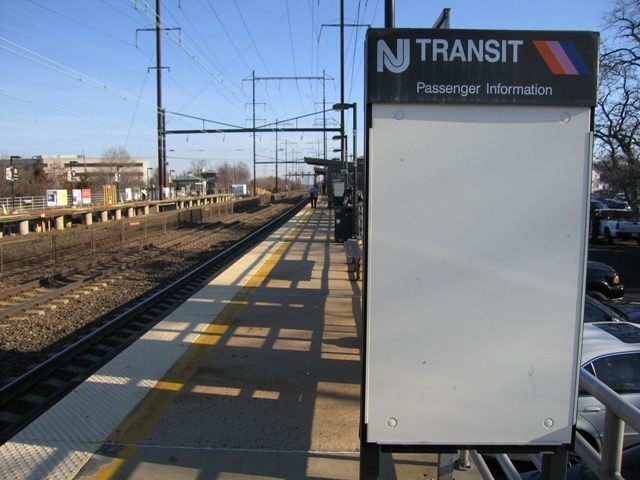 NJ Transit has some critical information to pass on, I thought I'd share it. The trains were down last Friday, I got a ride in with a civil engineering prof. who explained why they don't give partial credit to students: "Even if you get 3/4th's of the problem right, the bridge will still fall down. " 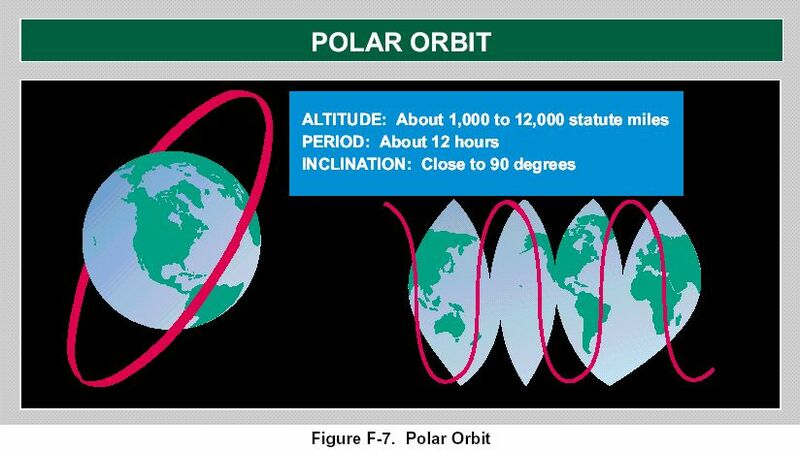 You will notice how the red trace of the satellite over Earth's surface extends off the globe into the mysterious black area, and, in fact, often leaves or enters Earth's space nowhere near the poles. At those points we see the satellite skipping out of normal space and warping over to the next spot. As cool as that might be, I think the real explanation of this is much more rational. If you look at Yoni's site on satellite tracking, you'll see that the orbital paths of polar-orbiting satellites look roughly like the red line in the Doctrine. The problem is the map projection. They should have used something like the Mercator or the geographic projection, but instead used some sort of pseudocylidrical projection thing. Thus, overlaying an actual satellite track on top of a random clip art of the Earth led to a highly suspect and non-accurate picture. In any case, we can rest assured that although physics has yet to allow for a warp drive, the military's graphic artists are boldly leading the way into the future. 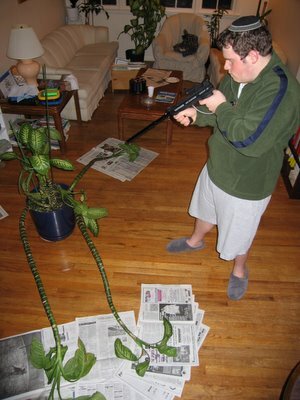 Beware of what plants you grow, because for all you know you might wake up in the middle of the night, and get eaten by your lovely innocent looking houseplant. It almost happened to me, here is my story. Once upon a time in the happy kingdom of La La Land… Wait wrong story let me try again. It was a dark and stormy night (ah here we are). Thunder pealed in the distance like the footsteps of giants. I walked unaware down the stairs into the clutches of the evil QUADIPLANTAPUS!!! 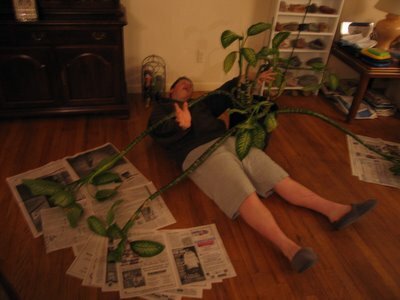 My mothers lovely dieffenbachia had shed its fake docile nature and unleashed the killer inside. Its long twisting trunks groping, its eyestalks looked for new victims, and me, AKA: Recipe for disaster. Unbeknownst to me, it had spotted me, and I was blissfully unaware of the danger lurking in my living room, stalking me. Then it pounced and I was trapped. It had me around my chest and waist, and when I tried to beat it into submission it got my hand into its gaping maw. I was lucky that night because I happened to have a can of evil plant repellent in my utility belt, and a machine gun in my bedroom. After I killed it, I looked around my other plants and discovered three separate plans to assassinate me, and what appeared to be a folder full of US nuclear secrets. I have had them tried and executed so I am now safe again, but when plants eat your dog, cat, fish, or little brother don't say I didn't warn you. While most students were relaxing, taking a break, Wildman and Lansey were working in nasty conditions. While their collegues were off . . . getting a tan . . partying . . . I just want to clarify a few things. Due to the non-mathy nature of the work, I was taking a massive break, also I got a tan and think: due to the nature of Chabad . . . If you read my little note in the photo, you will see that I have personally looted that record from the below location. It is by Jesse Hill, titled: Ooh Poo Pah Doo Part I from Minit records based in New Orleans. You can listen to it here, or read about it here. The convertable is sitting in the foundation of what was a house. What does "cakic" mean? What about "kejudcy,""zaqwi" or "qudif?". The truth is, I highly doubt these are words, although they do sound like words that might show up in Balderdash. But I didn't make them up, Blogger did. You know those annoying little word verification things (like the one you get when you, cough cough, comment on this blog)? Well, in case you are highly bored and like reading random strings of letters in the hope that one of them might be an intelligable message, you only need to follow this link: http://www.blogger.com/captcha. And then click refresh to your bored heart's content. Think of all the monkeys you are saving from typewriter button-pushing monotony! And the reason for this very short post. Out of my mind. Back in one week. I just spent a week cleaning out houses in New Orleans. It was fun. My foot fell into a festering hole of katrina soup and tonight we made a bonfire. by the way- its pronounced new aulins like audobon society. this has been me- reporting from New Orleans. It is T + 33.5eiπ hours to my complex variables final. Hence this very short post. To make up for the fact that last week I morphed into a small brown tuber very high in starches (Couchis Potatoist), I am now going to tell you something that might actually be educational (not certified by the Board of What's Educational or Not of The USA, Subcommittee MOR Mantelcommittee ONIC, as containing anything which in any way possibly cause the slowing down of the rotting of your brain). While driving around in an undisclosed location (Parking lot #BLUE 35 blue 35 hut hut hike) I was watching a seagull (specimen #987,384,244.275) flying around and I noticed that the color of the top of its wings where an almost total black while the bottom of the wing where white. This is evidence of the natural selection by survival of the fittest process forced into a blender than consumed by a human and well you can guess where it goes after that. I say this because the evil lamppost monsters ate the ancient seagulls of parking lots until only the ones that camouflaged on both the top and the bottom where able to survive and reproduce. This is how humans destroyed the natural process of selection. Because of this I feel that we must come up with a new theory, (which is mine, which is to say it belongs to me, such that I came up with it, natural selection is thin at one end thick in the middle and thin at the other end) which I will call THE PROCESS OF UNNATURAL SELECTION BY HAVING FUN WITH A MICROWAVE, TOASTER OR OTHER KITCHEN APPLIANCE. And of course I have to wish my parents a very happy anniversary. Remember, these are actual searches people did, I am not making this up. --First you find some soft ground . 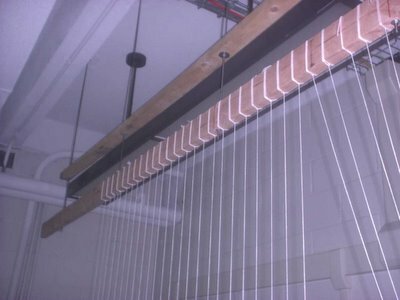 . .
if a pendulum is oscillating slowly what should we do?